Definitive proof that a Mango mustard coat and light blue ripped jeans are awesome together in a casual outfit. Extremely stylish and functional, this combination of a Mango Straight Pockets Coat and black chinos will provide you with excellent styling opportunities. Inject a mellow feel into this outfit by sporting a pair of tan leather boat shoes. This pairing of a mustard coat and a blue leopard sheath dress is a tested option when you need to look stunning in a flash. Introduce black leather pumps to the equation et voila, this getup is complete. 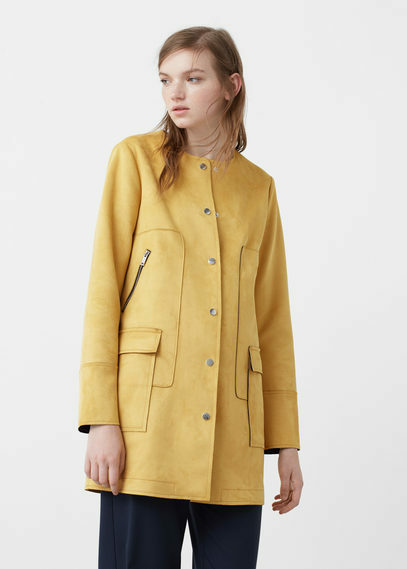 Wear a Mango Straight Pockets Coat and you'll be the definition of sophistication. Introduce a pair of black leather over the knee boots to your look and you're all set looking smashing. This ensemble with a mustard coat and blue denim culottes isn't so hard to score and easy to adapt throughout the day. Make your outfit more current by rounding off with a pair of brown leather flat sandals. If the dress code calls for a sophisticated yet cool outfit, rock a mustard coat with a teal shift dress. 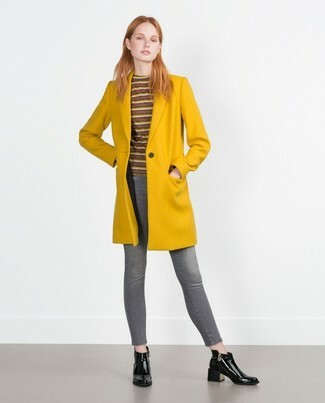 Putting together a Mango mustard coat with blue jeans is a comfortable option. On the shoe front, this ensemble is complemented nicely with dark green suede ankle boots. A Mango Straight Pockets Coat and grey skinny jeans are a great getup worth integrating into your daily styling arsenal. Opt for a pair of black leather ankle boots et voila, this look is complete. This pairing of a Mango mustard coat and black skinny pants is solid proof that a safe outfit can still be really interesting. All you need now is a great pair of red and black suede pumps.